I ran 8 miles today but did not feel like it. It's pretty rare that I don't want to get out there and run but I just was not feeling it today. It's probably because I hate doing 8 miles before work. Personally, it's just too much distance before work. I like 6 miles or less. I guess it does not matter anyway because this is my last 8 mile run during the week before the marathon. Everything else during the week is 6 miles or less. I'm going to enjoy the taper time. 25 days from now I'll be standing at the start line! Way back in the yellow! Nothing worth buying in my opinion. Plus, the timing clock is off from my actual time. Question of the day? 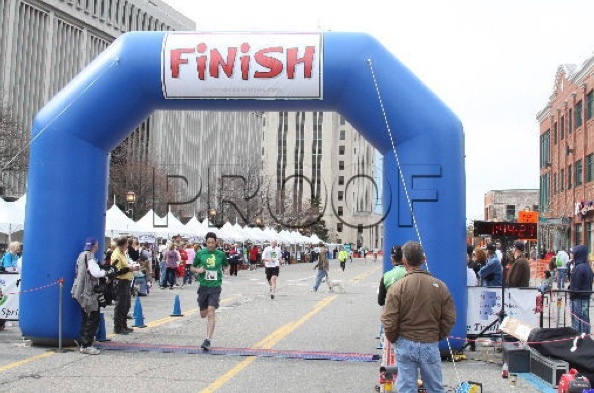 Have you ever purchased race photos? No for me! I've never purchased any pics....they've all been pretty scary looking. Maybe someday if I look halfway normal. I've never purchased race pictures. I either look like I'm asleep or like a disaster, so not really worth the money. I've purchased digital race photo sets for what I consider important or memorable races (Cleveland, NYC, and Boston marathons) or the occasional one where I think I look pretty good. I always cringe when I see the prices, though. Seriously, $29.99 for ONE digital file?? RunMichigan, on the other hand, offers great digital pictures for only $6.00 each. 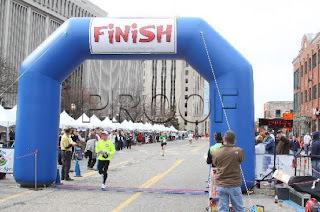 I have bought more pics from RunMichigan than any other outlet. They don't cover every race in the area, but tend to show up at the bigger ones (like the Martian races in April). 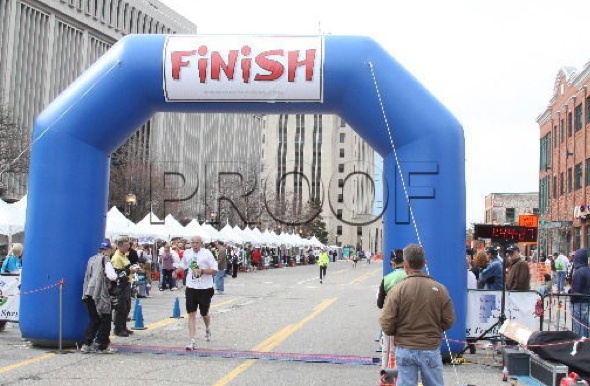 I have only purchased one race photo and that was from my one and only marathon. I've only purchased one race photo. It had me and my boyfriend riding his bike in the background. It was hilarious, so I had to fork over the bucks. The price of these photos is always too expensive! I read a post somewhere that there are on course photos, they just have not been posted yet. I do remember seeing photographers on the course as well. Maybe check back in a day or two and see if they have been posted? I have purchased 1 photo from the Detroit half and the Detroit full. It's the backdrop photo after the race, wearing my medal and with my dad. I always love tapering. I get to slow down. I have never purchased any race photo's. They are to pricey. Enjoy tapering. I'm also moving into taper/cutback time now. Winter is starting here in South Africa so the timing is good. I've bought many race photos over the years but I don't buy easily. It has become very expensive as well. Nope! Can't say that I have, but my wife did! Nope, no race photos for me.